Starting from Foilmore the trail passes through around 1km of low-lying farmland containing livestock before crossing the River Ferta at Gortmore. For the next 2km the Kerry Way ascends the lower slopes of Coomduff and skirts around the edges of fields and connecting laneways. The trail divides into two at Teeraha, with the section to Coars heading uphill on the left. The Cahersiveen Spur gradually descends through some more fields towards the crossroads at Srugreana. Not far from here is the ruins of an old workhouse from the times of the Irish Famine. The lane leading to the south-west begins a 2km section through the centre of bogland where turf can occassionally be seen drying out in stacks. A firm track underfoot allows for a relatively dry traverse of the bog. The Kerry Way then follows a gentle stream with overhanging trees before crossing the Carhan River. At Inchimacteige, a curious minature thatched cottage can be found upon meeting a boreen. This grassy road lasts for 2km until reaching a T-Junction at Chiclog. The Kerry Way has recently been rerouted from this junction and the signs contradict what is printed in many publications. Instead of instinctively turning right towards Cahersiveen, the trail goes left away from the town. 3km of lanes interspersed with farmland follow as the trail rises out of the base of the valley onto to slopes of Bentee. At Carhan Upper, there are magnificent views across the River Ferta to a mountain expanse from the isolated Knocknadobar right around to the distant Coomacarrea. Starting the last 2km in the environs of Hillgrove, the farmland eventually gives way to a stretch of deciduous forestry. The trail passes a hidden holy well which can be spotted by the red bench in front of it. After emerging from the cover of trees the trail passes a water reservoir and descends into Cahersiveen. 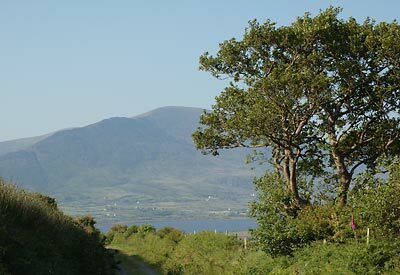 There are walkers who view the linking spur to Cahersiveen as an excessive 10km to the trail. 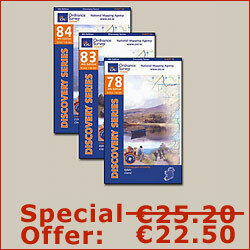 Some accommodation providers will be happy to collect these hikers by advance arrangement. The usual pick-up points are at Foilmore, Srugreana and Coars. 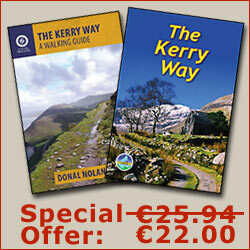 Alternatively, the short-cut is to leave the Kerry Way at Foilmore and head south-west to join the main N70 Road. This way is around 5km shorter in length to the trail. The final option is to stay on the trail and walk to Mastergeehy and avoid Cahersiveen altogether. This section is 14km further on from Foilmore which would mean Kells would probably be a better starting point instead of Glenbeigh.